Bob Lynn was born Oct. 26, 1926, to Leon Lynn and Beatrice Moore in Charleston, West Virginia. He received his BS in mechanical engineering and his MS in aeronautical engineering from Princeton. He later attended MIT’s Senior Executive Program. Lynn began his career in 1950 as a draftsman with the Bell Aircraft Corporation, in Buffalo, New York. The following year, he was transferred to Bell’s new division in Fort Worth, Texas. He served as a project engineer and then later as Bell Helicopter’s chief of research and development, director of test and evaluation, and director of design (1974-1977). 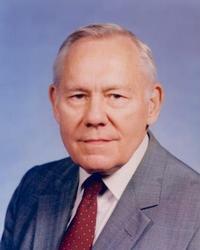 He retired in May 1991 as Senior Vice President for Research and Engineering. Lynn was instrumental in the design of the Huey Cobra and the Osprey; he began design work on the Bell XV-3 tiltrotor in 1951. Lynn was a Fellow of the American Institute of Astronautics and Aeronautics (AIAA) and the Royal Aeronautical Society (RAeS), and an AHS Honorary Fellow. He authored over 40 publications and held multiple patents. In 1996, he presented the Cierva Lecture to the RAeS. Lynn was a registered professional engineer in Texas, and a chartered engineer in Great Britain. Lynn served many organizations such as National Aeronautics and Space Administration (NASA), the US Army, the NATO Advisory Group for Aerospace Research and Development (AGARD), the Federal Aviation Administration (FAA), AHS, the Aircraft Industries Association’s Technical Council, the White House’s Office of Science & Technology Policy’s Aeronautical Policy Review Committee, North Texas Association of Higher Educations Council of Business and Industrial Executives, Engineering Advisory Boards for Georgia Tech and University of Texas in Arlington, the National Research Council’s Aeronautics and Space Engineering Board, and the FAA Technical Oversight Group on Aging Aircraft (TOGAA); he later received the FAA Award for Extraordinary Service for his participation with TOGAA. Lynn was also a board member of Tarrant County MHMR (originally “Mental Health and Mental Retardation”). Robert Reid Lynn passed away Saturday, May 27, 2017. He was 90.